By Sam Smith | 10.19.2015 |8:30 p.m. The Bulls Monday fell to 2-4 in preseason after a 94-86 loss to the Charlotte Hornets. The Bulls were led by Jimmy Butler with 18 points. Joakim Noah showing flashes of his 2013-14 form with 12 points, 13 rebounds and seven assists as Pau Gasol didn’t play. Taj Gibson was perhaps most impressive with 14 points and nine rebounds in just 17 minutes. Bobby Portis had 12 points and eight of the Bulls 14 fourth quarter points. 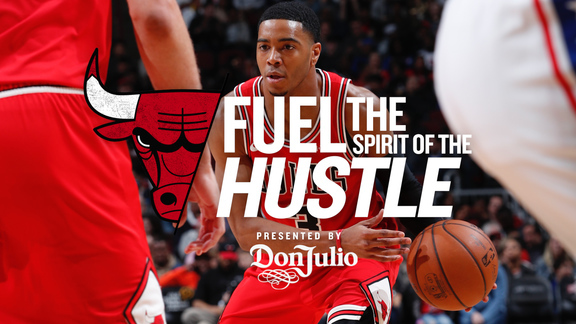 The Bulls went with more regulars in the fourth quarter with Butler and Noah playing, but the Hornets pulled away in the fourth as the Bulls offense went stagnant and the team was six of 27 on threes for the game and shooting 37.6 percent overall. The Bulls will host the Pacers in the United Center Tuesday. The Bulls went with yet another starting lineup with Gasol given the game off with soreness. The Bulls started Noah, Nikola Mirotic, Tony Snell, Butler and Kirk Hinrich. Derrick Rose was on the trip and shot before the game but remains unable to play after orbital surgery. Coach Fred Hoiberg said having everyone healthy and on the same page is still “a ways away.” Noah responded to his start at center with an aggressive offensive approach with six points in the first six minutes. Butler was active attacking the basket early for 10 first quarter points and Gibson looked quicker as the teams were tied at 33 after one as Charlotte shot 63 percent. The Bulls took a 51-50 halftime lead mostly with the aggressive play of Butler with 14 in the half and Gibson with 12 points and seven rebounds, three offensive. The Bulls dominated the offensive boards and were 12-2 on second chance points, but still gave opening on defense as the Hornets shot about 47 percent for the half. The Hornets took a 73-72 lead heading into the fourth quarter in a sluggish period in which the Bulls repeatedly were slow in their offense and shot poorly, 38 percent overall and 6-23 on threes through three quarters. The Bulls’ big rebounding edge kept the score close.